One year ago today, on August 13, 2004, Winston "DeRoyal" Carter was found hanging from a tree on County Road 65 in Tuskegee, AL. DeRoyal was 29 years old. DeRoyal was an African American man. The story wasn't going to get outside of Tuskegee, except a brave individual got the matter to the attention of Scott B. Smith, Jr., who conducted his own investigation. By chance, I ended up in touch with Scott B. and blogged his account of what happened to DeRoyal. Carter's body was found at 6:15 a.m. last Friday, August 13. Before the police arrived on the scene, the news got out to the community and a substantial crowd gathered and saw Carter's body, still hanging from the tree. Observers noticed that Carter's shoelaces had been tied together and used to hold his pants up instead of his belt, which was used to hang him from the tree. Community members also saw that there was no available surface for Carter to step off of in order to hang himself. Rather, he would have had to have climbed up the tree with no laces in his shoes and straddle the branch, in order to attach himself to it by his belt, and then lower himself down with his own arms from that position. As a method of suicide this seems highly improbable if not physically impossible. My name is Kathy Fetterman and I live in Northern Virginia. Winston Carter, "DeRoyal" as we lovingly called him, was my nephew - more like my little brother since he was raised by my parents (his paternal grandparents). I have major concerns about the nature of DeRoyal's death. People want to say he committed suicide, but I have trouble believing that. The officers in Tuskegee are so quick to rule it a suicide because it's easy. They never allowed us, his family, to see the crime scene pictures as they promised and these pictures were taken with a digital camera supposedly. I don't know how thoroughly they investigated the crime scene or anything. There are so many unanswered questions. I just don't believe my nephew would have done that to himself. A lot of other deaths have been covered right away - why has it taken so long for this to make the news, especially when there were so many people at the scene? I don't understand that either. raised some concerns about the police investigation of his death. Mr. Carter's family reports that the crime scene was never sealed off. The scene, where Mr.Carter was found hanging from a tree by County Road 65 in Tuskegee, was contaminated by passers through, making it impossible for anyone to cull proper evidence from the area. It has been distressing to Winston Carter's family that the Tuskegee Police does not seem interested in a true investigation. A number of people, including Kevin Hayden, contacted the Southern Poverty Law Center. The SPLC's response was deeply disappointing. Another affecting moment was when it turned out that Jeff had known DeRoyal. I received an initial letter, dated Oct. 27, 2004, acknowledging receipt of my request for the report. In the letter it stated, "As of this date, the report(s) has not been completed. Upon completion, a certified copy of the report will be forwarded to you." In the third week of November I received the report with a cover letter from the Legal Custodian of Records , dated Nov. 15, certifying that the attached report is "true and complete." The report itself has a cover letter, from the State Medical Examiner, dated Sept. 21, 2004. It was strange that the letter dated Oct. 27 said the report was not complete, though the report itself was dated Sept. 21. On page 4 of the report, on the line for Toxicology, it reads: "Specimen collected, but not submitted." I would wonder about this in any case, but I was particularly struck by it because Scott B. had said he heard that, at first, the police were insinuating that DeRoyal's death was drug related. Even if the police backed away from this assertion, why wouldn't they want a toxicology report if they had suspicion of this? Also on page 4, on the line for Clothing, it reads: "One of the sneaker laces has been removed and is used as a belt on the pants." Scott B. had told me about the laces having been taken out of DeRoyal's shoes for use as a belt, and how this made his climbing up the tree even less probable. What I find odd now is that they say it was only one of his shoe laces. I don't know what kind of shoes DeRoyal wore, but that would have to be a pretty long shoe lace to go around his waist. I read that he was not a large man (5' 9", 140 lbs), but I still had to wonder about this. I wish, for the sake of DeRoyal Carter's family, I had something conclusive to say. May his soul find rest. Timothy Mays was a former Student Nonviolent Coordinating Committee (SNCC) worker and member of the Black Panthers in Lowndes County, Alabama. He became famous to the world on March 7, 1965 in Selma, Alabama. Mays was among the civil rights marchers who set out that day to cross the Edmund Pettus Bridge and were beaten and tear gassed by Alabama State Troopers. News cameras were there when a State Trooper clubbed and knocked down Mays, who was carrying an American flag, which he kept aloft throughout the entire violent episode of the attempted march. "A trooper knocked me down, but I wouldn't drop the flag," he said. "I held on to it. My intention was to keep that flag until I died." Despite offers to buy the American flag for as much as $50,000, Mays would not sell it for any price. Instead, he promised to donate the flag to the Selma-Montgomery Historic Trail Interpretive Center now being built in Lowndes County. Timothy Mays died on Wednesday, July 8, at 8:00 a.m. from complications relating to his injuries in a car crash two years ago. He was sixty-one years old. Timothy Mays was born in White Hall, in Lowndes County, Alabama. His mother, Mary Francis Mays, was a pillar of the Civil Rights Movement in Lowndes County. Timothy Mays was a SNCC worker in Mississippi and then went on to work in Pike, County in Troy, Alabama, where US Representative and former SNCC Chairman John Lewis is from. Mays worked in the Tuskegee Institute Community Education Project (TICEP) while a student there. Mays was also a member of the Black Panthers community self defense unit, where he served as co-chairman of security operations, formulating plans concerning the defense of homes in case of attack by the Ku Klux Klan. Targeted by Klansmen to be murdered, Mays was shot at on a number of occasions. Mays' mother was one of the people who lived in Tent City, a settlement on Black-owned property, near Route 80 in Lowndes County, formed in 1965 for sharecroppers who were kicked off their land for voter registration activity. Timothy Mays worked to make sure Tent City inhabitants got fed and helped them find new housing. He also worked on other, similar projects to help Blacks who were evicted from their land. Timothy Mays was a close and trusted friend of Stokely Carmichael. Between the time that Carmichael left SNCC in 1967 and when he moved to Africa in 1969, he made secret return trips to Lowndes County. When he came into town, Carmichael always traveled with Mays. While they were both in SNCC together, Carmichael regularly deposited copies of his papers with Mays for safekeeping. Timothy Mays represented himself in civil rights lawsuits on a number of occasions and won each time. During the Selma to Montgomery March in 1965, there were student demonstrations at Alabama State University in Montgomery. Governor Wallace ordered Mays expelled from Alabama State for his participation in the demonstrations. Timothy Mays won a suit on his own behalf to be readmitted into the university, where he subsequently finished his Bachelors degree. More recently Timothy Mays represented himself in a discrimination suit after he was fired from Department of Transportation. Mays won, getting his job back and was awarded back pay, which he had not received before his death. After he won his job back, Mays was transferred to the Alabama Bureau of Tourism and Travel, where he was working until this week. Former Lowndes County, Alabama SNCC worker Scott B. Smith said, "Timothy was a man before his time in Montgomery." Mays did not believe that the Black church establishment in Montgomery had the interests of the people at heart. He frequently came up with his own ideas for civil rights work, which he pursued independently. When Hyundai was looking for a factory location in the South, it was Mays who spoke with the company's president and convinced him to put the plant in Montgomery. The state of Alabama held a banquet honoring Mays for his contribution to improving its economy. "Timothy was a walking historical dictionary who pursued civil rights even until his death," Smith said. Funeral services will be held on Wednesday, July 13, 2005 at Bell's Funeral Home in dowtown Haynesville, AL (near the post office). Viewing of the body will be from 10-11 a.m.
After the fueral there will be mixing and some food (prepared by Timothy Mays' mother, Mary Francis Mays), at the White Hall City Hall and Community Center. View recent video of Timothy Mays speaking about Bloody Sunday here. UPDATE 7/14: Additional details about Tent City (general location and year of formation) added in paragraph four. Montgomery March (photo by Benjamin T. Greenberg). After my trip to Mississippi for the 41st Annual Chaney Goodman Schwerner Memorial, I spent some time in Montgomery, Alabama with Scott B. Smith and Linda Dehnad, both from SNCC. ScottB was a SNCC worker in Alabama, with Stokely Carmichael, Bob Mants and Jimmy Rogers. They helped organize the Lowndes County Freedom Organization, which was the local political organization. The symbol of the organization was the black panther, which was its origin as a symbol for Black militant groups. Lowndes County is the county situated between Montgomery County and Dallas County (which includes Selma). ScottB was known as the Bone Man because he wore a bone around his neck to urge everyone to get together like Ezekiel's dry bones, to register to vote at the Lowndes County jail house. Whites placed voter registration at the jail house as a means to intimidate African American voters out of registering. The jail house was a place where African American men went in, frequently "disappearing," never to be heard from again. When family members came to inquire after their incarcerated loved one, they were told that the prisoner had been released and law enforcement officials did not know where the prisoner had gone. On Monday and Tuesday of this week, ScottB took me around Lowndes, Montgomery, and Dallas Counties to familiarize me with the work that he did with local communities and with some of the current conditions of African American life in those same communities today. On Tuesday one of our stops was at the home of Johnny and Betty Hall, members of the family of Mr. David Hall, who owned the property that was the first campsite on the Selma to Montgomery March. 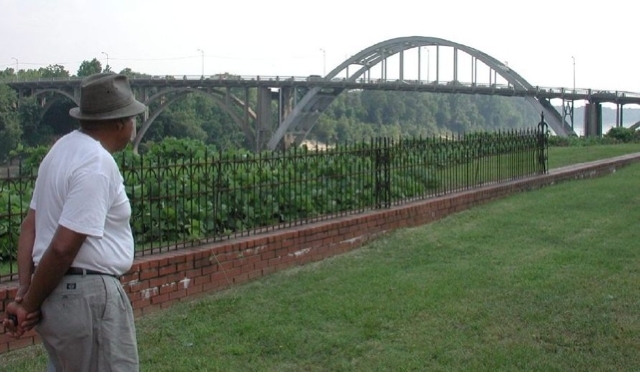 David Hall was an African American landowner on Highway 67, off Route 80, which runs east-west through Alabama, making the major route between Montgomery and Selma (and further west to Perry County, which was where Jimmie Lee Jackson was murdered by police, leading to the Selma to Montgomery March). David Hall had not been particularly involved in the Civil Rights Movement, but when he observed the beatings of marchers on Bloody Sunday, he drove his truck the eight miles into Selma, to the Brown Chapel AME Church to offer his land as a campsite for the civil rights marchers. Johnny and Betty Hall presently live on the land David Hall offered for the marchers' use. When we arrived at the Halls' home, we were met by some of Mr. and Mrs. Hall's grandchildren, who explained that their grandfather was on his way home from the hospital, where he had recently had heart surgery. They called him on his cell phone, and when he heard it was ScottB, Mr. Hall asked that we wait for them to get home. There were chairs set up in front of the garage, so we sat down and watched two of the grandchildren, an adorably pudgy twenty-two month old boy with cornrows and a pretty, slender girl of seven or eight, play out in the driveway, he on his big wheel and she on her bicycle with training wheels. While we sat there, ScottB started to tell me about Cleophus Hobbs, who lives just down the road in Sunshine Village. Mr. Hobbs was a SNCC worker who was well respected in Lowndes and Dallas Counties. He wore a cowboy hat and carried a gun. He was shot at a number of times by whites and shot back in self-defense. The non-violent philosophy was not dominant in rural areas of Alabama, like Lowndes County, where Klan violence was such that fighting back was often a necessity. Cleophus Hobbs was an organizer in Selma before the famous march: he worked on demonstrations around education and voter registration. Children's education continued to be a concern of Mr. Hobbs throughout the years. Before long, the Halls' car rolled in with Mr. and Mrs. Hall and a few more of their grandchildren. Though Mr. Hall was just out of the hospital, he sat down, out in front of the garage with us to talk for a few minutes before going inside to rest. One thing led to another in our conversation, and ScottB mentioned something about visiting Mr. Hobbs since he was just down the road. Mr. Hall then told us the news: Cleophus Hobbs had died the Friday before last, on June 10. He died peacefully, in his sleep. The funeral had already come and gone. Next year, June 10, 2006 will be the first celebration of Cleophus Hobbs Day. Johnny and Betty Hall have offered Campsite 1, which is still on their family land, for the event. Campsite 1 is one of the stops on the National Park Service Historic Trail, following the route of the Selma to Montgomery March, and it is on the same road Mr. Hobbs lived on. The event will be sponsored by the White Hall Village Educational Association, which was founded by ScottB and Linda. The event on June 10, 2006 will be a celebration of Cleophus Hobbs and it will be an opportunity for people in the area to talk about the things they are currently dealing with and to strategize and organize around their concerns. The first Cleophus Hobbs Day will also be a fundraiser for a commemorative plaque to be placed in Campsite 1, in memory of Mr. Hobbs. ScottB is encouraging other SNCC members to have celebrations for others who have passed and to use these occasions similarly for recognizing deceased civil rights workers' contributions and for addressing the problems people are facing now. Let there be a James Forman Day, an Ella Baker Day, a Fannie Lou Hamer Day, an Emmett Till Day, and so on. ScottB points out that these events could also be used as fundraisers to do things like giving money to families who could not afford the funeral costs for their loved ones. For more information, contact ScottB, scottbsmithjr[at]yahoo[dot]com or Linda Dehnad, lindadehnad[at]hotmail[dot]com.